I found a problem with this plugin recently. It can be reproduced both in Cubase and FL studio. I modify values of plugin parameters, then I save the project. After I reopen saved project, settings which I saved in Bionic Supa Delay don't work. To make them working, I need to open GUI of the plugin. It looks like after doing that, someting is reloaded and Bionic Supa Delay uses proper sound settings and generates expected sound. I reported this to FL studio technical support and they confirmed the problem occurs also in different DAW. Here is my post on FL studio forum. Thanks for your feedback and sorry for the delayed answer.. I spent many hours this weekend hunting down and fixing the bug you came accross. Finally I had to reprogram a section of the plugin and debug some unwanted side-effects. I created a test version which seems to work fine on win xp 32bit and win 7 64bit (bridged). Please download this fixed version here and let me know whether you find any problems with it. if everything is ok, i'll release this as an update. From another user at kvraudio.com I got the hint, that the factory presets have been damaged while debugging the plugin (filter/reverb switched off on all presets). So I will also fix this issue and then release an official update. version 1.1 is ready for download.. 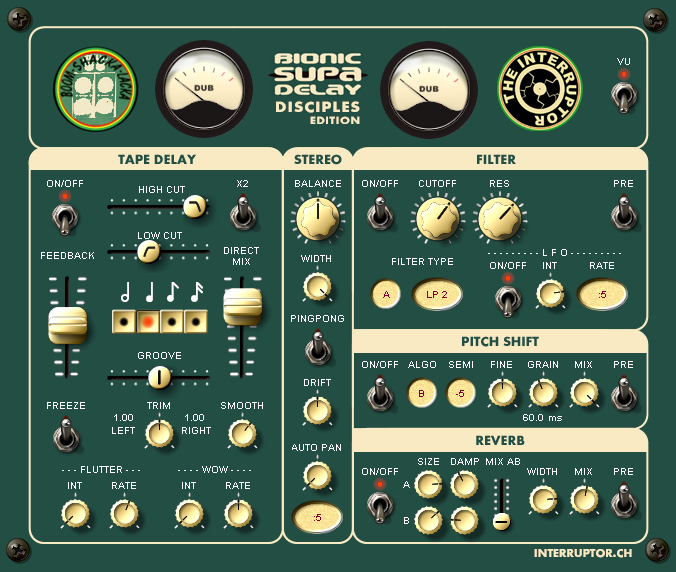 I have just spent the last 2 hours playing with the Bionic Supa Delay, no joke this is the tuffest software dub delay on the planet and i give thanks to the creators. I have one humble request, is it possible to re-create a version of this VST with everything the same except to make the delay section digital for us digital heads ? we could then do live delay time switching without the signal degrading, i am willing to pay money for this. A digital version.. That's a nice idea! I would add a bit cruncher so you can adjust your echo flavour from 24bit cristal clean to 8 bit grunch and lower. Just tried to listen to the linked tracks, but they seem to have disappeared already. i had a go at a digital version the other day, but it's not yet finished.